I woke with a bad feeling. I didn’t know why I had a bad feeling – I just did. ‘I’ll get it.’ Untangling limbs from blankets, my brother stumbled from our bedroom. I buried my head in my pillow. Maybe it was the look on his face that had me on my feet. Or maybe it was that strange feeling I had, growing stronger. I scoped Siki from the end of my bed. I’d have to tqke him for a walk soon. If he peed on Mama’s rug again, she’d be upset. She said I could have a dog only if I cleaned up after him. War is coming to Sarajevo and Niko and his family are warned to leave while they can. But Niko’s father is sure that the warring sides will soon see sense and all they have to do is keep life as normal as possible until things settle down. Niko, his parents, his brother Jarko and his sister Danijela are soon among only a few remaining occupants of their apartment building. But rather than settle, the war escalates. Others leave but Niko is reassured that the family of his friend, Nedim, are also staying. Food becomes scarce, the streets become dangerous and still the family stay. Niko’s brother and sister have been at university but although some classes continue, it’s not always safe to travel. It becomes more difficult to know who to trust and even Niko and Nedim quarrel. Escape seems the only option. But it’s not easy, and it’s not available to all. Niko has been oblivious to the tensions that have led to the Balkans war. But no longer. War will not be ignored. Page by page, the reader travels with Niko as life in his home town changes and people flee. Others stay, but not all for good reasons. Niko’s family is a close one, but as with all families, there are differing opinions. War brings out the best in some people, the worst in others. Nothing in Niko’s life has prepared him for the world he now lives in. Family loyalties and friendships are tested as Niko and his family struggle to survive in a war that makes little sense to them, but which affects them anyway. 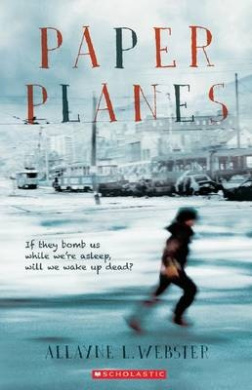 Paper Planes is based on a true story, from the Balkans War that reaches all the way to Adelaide Australia. Recommended for upper primary readers.